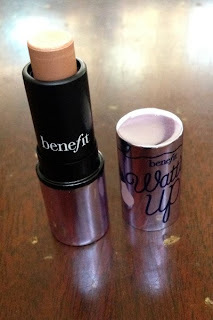 THE SKINNY: This is one of the stranger highlighting products I’ve tried in recent months. Maybe it’s because this is a sample size, so it doesn’t include the blending sponge that’s built into the bottom of the full-size product. This stick applies a thin coat of champagne-colored, cream-to-powder product. It is a pretty color on my fair skin. But I found it really hard to blend with either my fingertips or a foundation brush. I wound up with a stripe of shimmer. The larger the area I tried to highlight, the more noticeable that stripe appeared. It’s sad, because the color is so nice and the idea behind the product is good. I’d stick with Benefit’s High Beam, which is a liquid application, instead. KEEP OR TOSS: Toss the sample. I found it too difficult to use, and $30 is too expensive to gamble on the full-size with applicator. CHECK IT OUT: Benefit says to use Watt's Up on your brow bone and cheeks.